42-21. This is the combined record of the remaining 7 opponents on the Seahawks schedule. The next seven weeks will be an all-out bloodbath and if the Seahawks can survive they will likely be playoff bound, perhaps even as the NFC West champions. This week starts arguably the toughest stretch of the rest of the season; 3 out of our next 4 games will be played away from CenturyLink Field. It starts this week in front of one of the toughest crowds in all of sports. 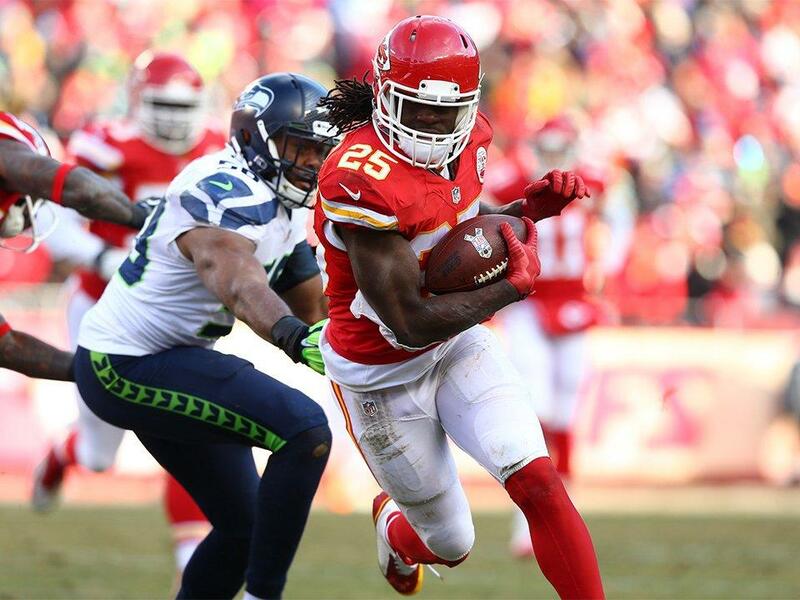 The Seahawks head to Arrowhead Stadium to take on their former division rivals, the Kansas City Chiefs. The Seahawks are 6-3 and are coming off an impressive 38-17 win over the New York Giants. The Chiefs are red hot coming into this week, sitting at 6-3 having won their last 4 games in a row. Kansas City leads the all-time series with the Seahawks 32-18. The Seahawks have not beaten the Chiefs at Arrowhead Stadium since 1999. In their last meeting the eventual AFC West champion Chiefs came into Seattle and beat the Seahawks 42-24 in 2010. Here are my thoughts and what I will be looking for in this game. This week on offense I ask one simple favor of offensive coordinator Darrell Bevell. Please do not overthink your play calls in order to outsmart the defense. Too many times this season the Seahawks have passed the ball on first down, tried to run the ball on second down, and set themselves up for third and moderate or third and long, oftentimes resulting in fourth down and a change in possession. Personally I get very frustrated when this happens. Call me conservative but when you have weapons on the ground like Marshawn Lynch and Russell Wilson there should be no reason not to establish the run on first down. I believe controlling the clock and the tempo of the game via the running game is crucial this week. Specifically I would like to see the Seahawks continue to call designed runs for Wilson. Opposing defenses have been burned on Wilson quarterback keepers and bootlegs the past few weeks. The Seahawks have averaged 10 first half points in their road games this season but in their last 2 games on the road they have failed to score a touchdown. Having Wilson as a threat on the ground could translate into early game points, something that could make the difference between the Seahawks winning and losing this game. Last week the Seahawks broke the franchise record for rushing yards in a single game. I believe that if we can rush for at least 175 yards this week, we can come away victorious. The Seahawks are getting healthier on defense this week with the return of safety Kam Chancellor. Unfortunately we take two steps back along the defensive line as starting defensive tackle Brandon Mebane is lost for the rest of the season with a torn hamstring. This week on defense I believe the most important position group to watch is the linebackers, mainly because of the quarterback they will be facing. Chiefs quarterback Alex Smith has been known to be a very conservative pocket passer. Even dating back to his days in San Francisco, Smith will rarely take shots down the field for large chunks of yards. With Malcolm Smith returning from injury this week, our linebacker corps is bolstered but I will have my eye on how Alex Smith plays the middle of the field patrolled by K.J. Wright and rookie Kevin Pierre-Louis who will make his first career start this week at outside linebacker. Keep an eye on the potential matchup between Wright and Kansas City tight end Travis Kelce, who has played a big role in the Chiefs offense in recent weeks. We must make sure we tackle well and not give Smith room to make easy completions. There is one last thing the Seahawks offense must take into account. Does the number 142.2 mean anything to you? That is the new Guinness world record for “loudest crowd roar at a sports stadium” which was once again broken last month by Chiefs fans at Arrowhead Stadium. This week for the first time in a very long time, crowd noise could play a significant factor in the effectiveness of the Seahawks offense. Seattle has played in loud environments in the Russell Wilson era and we have done an exceptional job of handling the noise. If the Seahawks have several pre-snap procedure penalties this week, this could be a very long and frustrating game. Believe it or not, the Kansas City Chiefs currently sport the best pass defense in the NFL, allowing an average of only 205 passing yards per game. The Seahawks offensive line will have their hands full with defensive end Justin Houston but I am afraid that the intense pressure from the Kansas City front seven will force Russell Wilson into bad throws. This could give the Chiefs secondary great opportunities to make plays and force turnovers. My X-Factor player to watch for Kansas City this week is cornerback Sean Smith. Smith is in the middle of his second season with the Chiefs and this season he leads all Kansas City cornerbacks in passes defensed with 10. He also has one of only 4 Chiefs interceptions on the year. Smith will likely face a lot of Jermaine Kearse and Paul Richardson on the outside, as he matches up better with them being 6-foot-3. The stats may not be there, but after watching film the Chiefs have a very underrated ball-hawking secondary on the whole. If the pass rush steps up and flusters Wilson, they will likely be given every opportunity to make game altering plays. Random Thoughts: The Seahawks have one more opportunity to wear wolf grey this season and there is a 25% chance it will happen this week. However since we wore wolf grey in our last road game my guess is that we will wear white this week. The Chiefs will likely wear white pants with their red jerseys… Kenny Albert, Daryl “Moose” Johnston, and Tony Siragusa have the call for FOX this week… Bill Leavy is the referee this week and that really makes me mad. Leavy has already officiated one Seahawks game this season, our 30-23 loss to the Dallas Cowboys 5 weeks ago. There were some pretty questionable calls in that game. That scares me for what could be in store this week… The game time temperature in Kansas City is supposed to be in the high 20’s or low 30’s. Good thing we had that cold front come through Seattle this week. I’m glad the Seahawks prepared for the cold by practicing outside… I need a win in fantasy football this week. I believe a win would lock me into the playoffs. Among the guys in my starting lineup is Doug Baldwin. I would not mind a Baldwin touchdown at all this week (obviously)… I am glad the city of Seattle gets Lions/Cardinals in the 1pm time slot this week. I may have to skip RedZone in the afternoon so I can watch that game in its entirety… We need this win. A big load will be taken off of this team and the 12th Man if we can come away victorious. Add a Seahawks win with a Cardinals loss and that sets up the biggest game of the season next week at CenturyLink Field. Hopefully we can make it happen. Prediction: I get this feeling watching the Seahawks play on the road that we have a 50/50 shot at coming away with the win. This week the individual matchups are in our favor from a physical perspective but I am not sold that the Seahawks can play a complete game. Although I think we will score a touchdown in the first half I think our offense will struggle early. With the Seahawks battling the crowd noise and both teams battling the cold I could see this being a relatively low scoring game. At the end of the day, the Chiefs will hold a 3 point lead and will be able to hold the Seahawks without points on their final drive of the game. The Chiefs will win and the Seahawks will fall to 6-4 (fingers crossed I am wrong). Check back on Sunday night as I review this week’s game. Go Hawks! 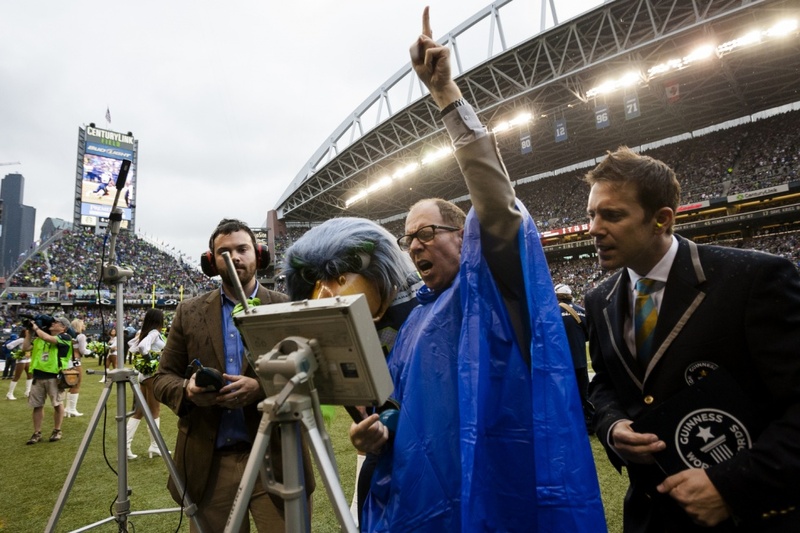 On September 15th the Seahawks and CenturyLink Field broke the Guinness World Record for “loudest crowd road at a sports stadium” when the 12th Man was registered at 136.6 decibels during our win over the San Francisco 49ers. The record stood for 28 days. On Monday night the 12th Man will attempt to reclaim what is rightfully theirs. “Volume 12,” the group responsible for organizing the Guinness World Record attempt announced Tuesday night via their Facebook that Guinness will be in attendance once again for the Seahawks Monday Night Football game against the New Orleans Saints. The Seahawks will attempt to break the record set by the Kansas City Chiefs on October 13th when Chiefs fans at Arrowhead Stadium registered at 137.5 decibels. Since Guinness’s last visit the rules of the record attempt have eased up. Officials from Guinness will record the duration of the game and will register the highest decibel reading throughout the game. The 12th Man will also be at a disadvantage once again because the Seahawks have declined to get officially involved with this attempt, thus there will be no formal announcement to cheer and scream during the game. This is a big key to why I believe the Chiefs were able to break our record. I believe with help from the Seahawks we would shatter Kansas City’s record but without knowing what our goal is it is possible that we will come up short. All it takes is one big play for a sudden burst of noise to break the record. Kansas City surpassed our mark when an interception was returned for a touchdown mere moments before the end of the game. If you are attending Monday night’s game please be as loud as you can throughout the entire game so we can reclaim our reputation as the loudest stadium and the loudest fans in the world! What a dominating performance. 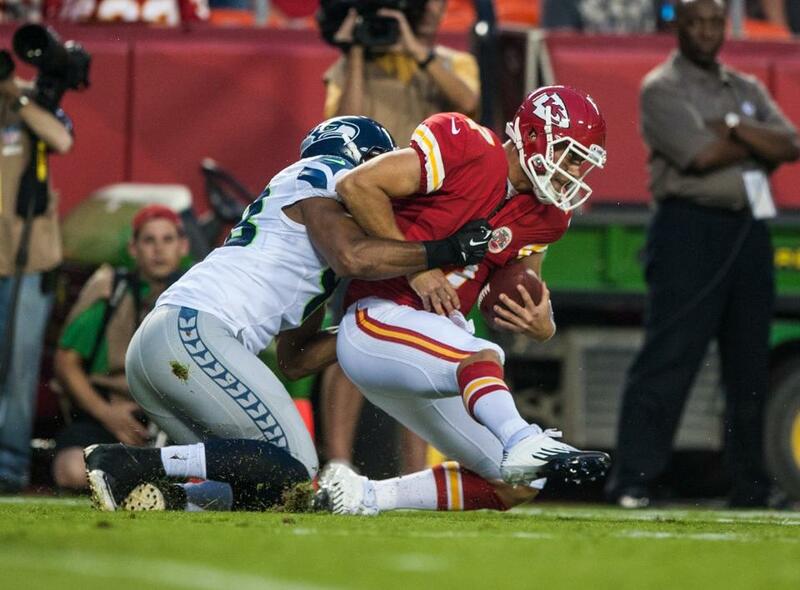 The Seahawks annihilated the Chiefs tonight in Kansas City by a final score of 44-14. The Seahawks improve to 3-0 in the preseason for the first time since 2009 and for only the third time since 1990. It is hard to critique this game in any way because of how well all three units played. Here are a few of the many thoughts I noted during Friday’s game. Russell Wilson will start soon: Russell Wilson is my player of the game without a doubt. Wilson played an amazing three quarters of football on Friday night. Wilson ended 13/19 for 185 yards and two touchdowns. He also added 58 yards on the ground. After the game, Coach Carroll said that he expects the quarterback competition to stretch into next week with a starter named most likely a day or two after we play Oakland and for good reason. In my eyes this quarterback competition is as close to a photo finish as possible. Wilson proved that he was prepared and ready to handle a game situation with the starters on the field. “If you are prepared, there is no reason to be nervous” Wilson said after the game. Wilson’s preparation and execution this entire preseason has been an impressive strength that I believe could earn him the starting job. It will be interesting to see what kind of playing time the quarterbacks will get next week. If Wilson has another strong outing next week whether he is the starter or the backup, I am predicting he will be the starting quarterback against the Arizona Cardinals on September 9th. No wide receivers went over the top this week: I think this is a good thing though. 5 wide receivers made catches this week. None were more impressive than Terrell Owens’s over-the-shoulder catch for a 40 yard gain. I am interested to see which (if any) wide receivers are cut during the first wave of roster cuts on Monday. If the coaching staff decides to part ways with a couple of receivers on Monday, I think it will be easier to predict which wideouts will make the 53-man roster. Last season in the last preseason game against Oakland, many believed that Golden Tate was fighting for a roster spot and needed to have a good game. He had a good game and kept his spot. Next week I believe all eyes will be on Terrell Owens. If he gets a good amount of playing time, and makes a few good catches I think Owens has a good chance to make the regular season roster. It was nice to see Sidney Rice back and his one catch for 8 yards was superb. Wilson looked Rice’s way immediately and if Rice can stay healthy and Wilson is the starter, expect that connection to pay dividends during the regular season. I noted that Ricardo Lockette did not see any playing time in the first half with the starting unit. To my memory he only had one target in the entire game; a streak down the near sideline in the fourth quarter on a pass thrown by Tarvaris Jackson. I am starting to wonder whether Lockette’s roster spot is in jeopardy. After Lockette has been praised by the coaching staff, you have to wonder why he would not get any looks with the starters. Dominating Defense: In the first four Kansas City offensive possessions the Seahawks forced 3 three-and-outs. In addition, Earl Thomas returned an interception 75 yards for a touchdown and Cordarro Law forced a fumble deep in Chiefs territory. Back during our NFC West dynasty years when the opponent was facing third and long it was almost a sure thing that the Seahawks would stop them and force a change in possession. Watching this game I feel the same way I did a few years back. I have full confidence in our defense to make sure we do not allow significant yardage on third down. A fulfilled desire: In my preview yesterday, it was my hope to see the Seahawks amp up their pass rush. I called for a minimum of two sacks in the first half. Thanks to Greg Scruggs and Mike Morgan, the Seahawks were able to sack Matt Cassel twice in the first 13:42. Unfortunately we could not get to the quarterback after the first quarter but the defense as a whole made enough big plays to make sure the Chiefs did not come relatively close to touching our lead. My hope was satisfied but I want to see more pressure but the pass rush specialists next week. Special special teams: The Seahawks special teams looked great Friday night. Three big points coming from special teams. First, I only counted two kickoffs that were returned past the 20-yard-line. We did a great job tackling and closing running lanes on kickoff coverage. Secondly, Golden Tate may have earned the punt return job this season. Tate returned a punt 92 yards for a touchdown. Third, Jon Ryan did not have his first punt until the 13:20 mark in the fourth quarter. Ryan only had two punts total Friday night which speaks volumes to the efficiency of both the offense and the defense. Kansas City outlook: If Friday night is any indication, the Chiefs may struggle mightily this season. Although the weapons are there, it didn’t seem like Matt Cassel clicked with any of them consistently. I realize the AFC West has been deemed wide open by a lot of people but with terrible play like on Friday night, the Chiefs may be heading towards the cellar and a high draft pick in 2013. The best player for Kansas City Friday night was Dexter McCluster. McCluster, who apparently has been converted into a slot receiver, led the Chiefs with 7 catches for 61 yards and a touchdown. If Cassel’s reads are all unavailable, expect a lot of checkdowns to McCluster this season. Even for a secondary option, Cassel seemed most comfortable when throwing McCluster’s way. Random Thoughts: I spent a lot of time talking about the “faithful” Chiefs fans and the atmosphere of Arrowhead Stadium this week. I understand it is the preseason but it was pathetic to see well over half the seats empty. The Chiefs are the hottest ticket in Kansas City and even for a preseason game they should be able to draw more fans than what showed up Friday… Golden Tate wins the award for most entertaining player this week. Tate was shown stumbling around like a sloppy drunk after his punt return due to shortness of breath. He was struggling to find an oxygen mask. Later in the broadcast Tate was shown picking his nose. I wonder if he found some buried treasure… It is safe to assume the white jersey/gray pants combination will stick around. The combo actually looked pretty good on the field… The Seahawks escaped in great health once again. The only injury of note was cramps in the calf of cornerback Brandon Browner. He will be fine… Penalties really hurt Kansas City. Tamba Hali was called for consecutive roughing the passer penalties and multiple pass interference penalties. The Seahawks surrendered only 37 yards worth of penalties tonight. A great improvement compared to the Denver game… The Twitter hashtag #RussellMania was trending in Seattle during the first half. It is good to see the 12th Man getting excited for this kid whether he is our starting quarterback or not. Had two pints of Mac & Jack’s tonight. Delicious. Need I say more? Upcoming: Look for a brief Seahawks fantasy outlook this weekend and I will also post my predictions for the first round of roster cuts. I will choose and explain my choices for which 15 players will be cut on Monday. Expect the fantasy outlook post on Saturday and the roster cuts prediction post on Sunday. Thanks for reading everybody. Go Seahawks! 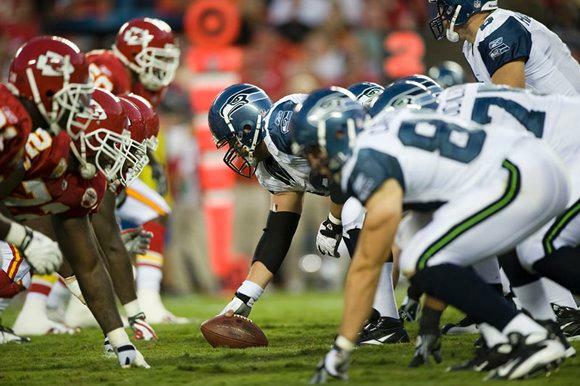 The Seahawks travel to Kansas City this Friday night to take on the Chiefs in week 3 of the 2012 preseason. The Seahawks enter this game at 2-0 on the preseason and are coming off an impressive 30-10 win over Denver last week. 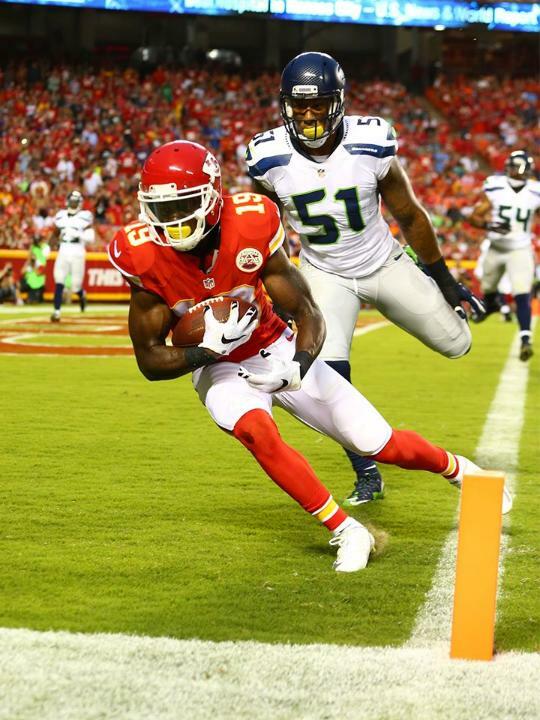 The Chiefs are 1-1 in the preseason and are coming off a 31-17 loss to the St. Louis Rams last weekend. Here are some things I will be keeping an eye on this week. Russell Wilson starts at quarterback for the Seahawks this week and as a fan, I am a mix of nervous and excited. I know Wilson is competing for the starting quarterback job with Matt Flynn but in my opinion he has very little to lose. Not many people including myself gave Wilson a good chance of winning the job. A strong performance by Wilson this week could potentially earn him the job but if he struggles he will most likely earn the backup quarterback job, the position that I thought he would win from the start. 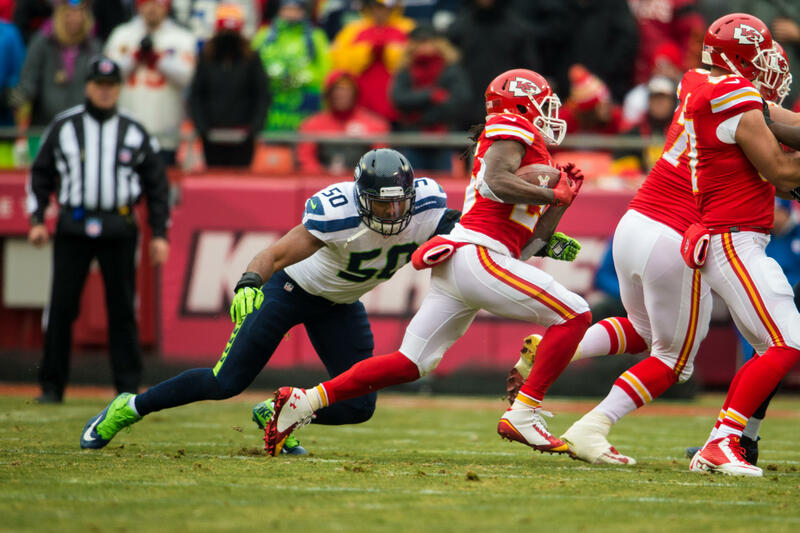 I am most interested to see Wilson’s on-field chemistry with the starting wide receivers and how he handles increased speed and pressure coming from Kansas City’s starting defense. One of the highlights of Wilson’s play thus far is his pocket presence and ability to keep plays alive. What I hope does not happen is Wilson trying to do too much, meaning he will force passes into tight holes or tuck the ball and run prematurely if the pocket collapses. Kansas City does not have the best defense in the league. They do not have the worst either. This is a very solid test for Wilson and if he performs well, I wouldn’t be surprised to see him start next week against Oakland and to see the quarterback competition stretched into next week. Bobby Wagner has locked down the starting middle linebacker job. With all the uncertainty around that position battle behind him, Wagner can now concentrate on calling the first-team defense and building a rap with the rest of the starting defense. On defense this week, I am most interested to see if the Seahawks can finally establish a steady pass rush. My goal for this game is at least two sacks in the first half. I do not care if it is Bruce Irvin or Chris Clemons or even Red Bryant getting to the quarterback. I just want this unit to show us fans that we can be dominant in both aspects of the defensive game plan. So far, that has not happened even though the run defense and the secondary have done an exceptional job in proving dominance. One last defensive element I would like to see this week is the handling of the no-huddle offense. Last week Peyton Manning was very successful in picking our defense apart when running out of the no-huddle. If Matt Cassel and the Chiefs run no-huddle Friday night, I want to know we can stop them. We need to make sure the right personnel are on the field and make sure we can get stops, especially if the Chiefs are passing. Special teams is gradually becoming an area of concern for me. We gave up a punt return touchdown in week one and had two Jon Ryan punts blocked in Denver last week. My worries would be eased significantly if we make sure there are no big returns by Kansas City return men and if we make sure any holes along the line are filled on punt coverage. I am not sure if Dexter McCluster will be returning kicks this week but if he is we have to be solid because McCluster can be a very explosive threat if he has daylight in front of him. The Chiefs will be playing on offense this week with full health. After winning the AFC West in 2010, Kansas City fell into last place last year, primarily because of their losses on the offensive side of the ball. Last year they lost quarterback Matt Cassel, star running back Jamaal Charles, and up-and-coming tight end Tony Moeaki; all of whom are healthy to start the 2012 campaign. The Chiefs have a new head coach in Romeo Crennel and wide receiver Dwayne Bowe has just ended his offseason holdout. When you also include free agent acquisition Peyton Hillis, the Chiefs have the weapons to be an explosive offense this season. I will be looking to see how all of these players click under a new head coach in the first half. On defense, the Chiefs are led by stud linebacker Derrick Johnson and safety Eric Berry who has returned from a knee injury that sidelined him for the majority of the 2011 season. Russell Wilson needs to make sure he is spot on with his throws because if not, Johnson, Berry, and the rest of the Kansas City defense will make him pay for his mistakes. Random Thoughts: Like I blogged about on Wednesday, the Seahawks have a difficult time playing at Arrowhead Stadium. They have never played there under Coach Carroll therefore I am curious to know whether the team will do anything differently in preparation and during the game to handle the raucous red sea… The Seahawks announced that they will wear white jerseys and gray pants this week. In my opinion that may be the strangest of all our possible uniform combinations… One person who may be split on who to root for this week is actor Rob Riggle. Riggle is a diehard Chiefs fan and graduate of the University of Kansas. However, Riggle made an appearance at Seahawks training camp last season because of his friendship with Coach Carroll. My guess is Riggle will be pulling for the Chiefs. POW!… I will be watching from home on Friday. My dad offered to buy a growler of Mac & Jacks and of course I will never turn down beer as fine as that while watching a Seahawks game! Prediction: Russell Wilson will do a decent job but not good enough to extend the quarterback competition for much longer. Matt Flynn will come in to play most of the second half and will completely dominate the Kansas City backups and the Seahawks will escape Arrowhead with a rare victory. As always my review post will most likely come Saturday afternoon. Thanks for reading everybody. I greatly appreciate your comments and support. Go Seahawks!